SAN JUAN — Senator Elizabeth Warren blamed President Trump and what she considers a culture of crony capitalism in Washington for Puerto Rico’s ills in an impassioned speech on the still-recovering island Tuesday. Warren, who is three weeks into her formal exploration of a run for president, also criticized Trump’s demand for an “ugly” wall on the Southern border as a tactic meant to sow division among people of different races. The Trump administration reportedly eyed disaster relief funds earmarked for Puerto Rico and other hurricane-battered regions to pay for the wall during the ongoing government shutdown. Warren argued that Trump deliberately uses cruelty against immigrants and people of color, citing the examples of separating children from their parents at the border, demanding the “ugly” wall, and “ignoring” the suffering of those hit by Hurricane Maria in Puerto Rico. “With Trump, cruelty is not an accident; it is part of the plan,” Warren said. The Massachusetts Democrat hasrarely mentioned the president’s name in her early campaign swings through Iowa and New Hampshire, focusing on introducing herself to voters through her childhood in Oklahoma and winding path into academia and the study of bankruptcy. But she has taken a more pointed tone in recent days as the shutdown drags on, referring to the wall as a “monument to hate” on Monday during remarks commemorating Dr. Martin Luther King Jr. Over the weekend, Trump offered to extend protections to some young undocumented immigrants in exchange for his wall and ending the shutdown, a move that hasn’t appeared to tempt any Democrats. Warren said this amounted to an “insult” to the people of Puerto Rico. 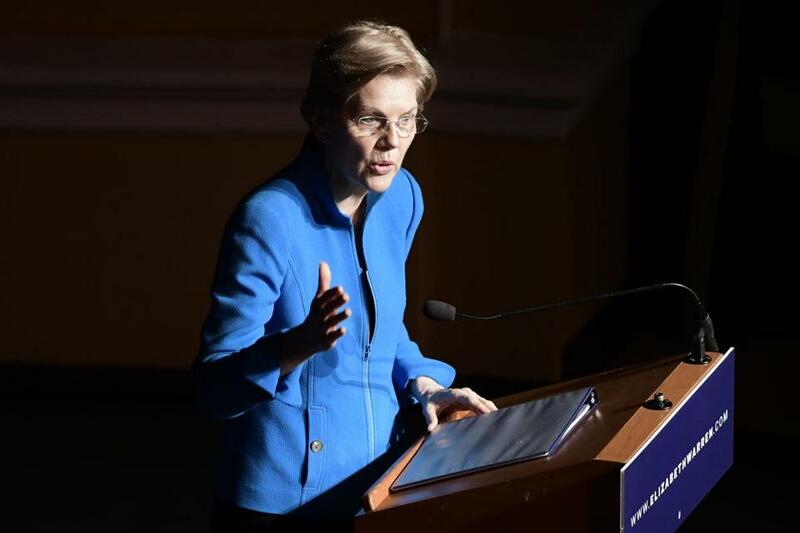 In her speech, Warren outlined a “Marshall Plan” of financial support for debt-stricken Puerto Rico, and demanded accountability for the botched response to the 2017 hurricane, which a Harvard study estimated led to the deaths of more than 4,000 people. Puerto Rico may seem like an odd stop for a presidential candidate, given Puerto Ricans are US citizens who cannot vote unless they move to the United States. But relocated Puerto Ricans make up a key Democratic voting demographic in the swing state of Florida, and, perhaps more importantly, the island serves as an allegory for one of Warren’s larger themes as a candidate. Warren paints Puerto Rico as a cautionary tale for what happens when government stops working for its people. Instead of crafting a debt forgiveness plan, the government allowed Wall Street financial institutions to profit off much of the island’s $70 billion debt while citizens suffer from cuts to public education and other austerity measures, she says. “More than 3 million US citizens who live here are at the mercy of Wall Street corporate executives who are focused on squeezing out every last penny of profit from this island,” Warren said. The message appeared to resonate with the crowd, which enthusiastically applauded her proposals. One man shouted “lock ’em up!” when Warren discussed her plan to ban lobbying by former lawmakers and other anticorruption measures. “You got an idea there,” Warren replied with a laugh. She was introduced by San Juan Mayor Carmen Yulin Cruz, who called Warren a “friend” to the island and told the crowd in Spanish her dedication to the place and its troubles went well beyond a desire for photo ops. Warren’s first visit as a senator was in 2015. “She comes to Puerto Rico and talks to the people of Puerto Rico,” the mayor said. Warren leaves the island Wednesday to head to Columbia, S.C., for her first stop in that crucial early primary state as a candidate.